OkeSayur orders the products from their partner merchants and delivers them to their customers’ doorsteps. Students from the Gadjah Mada University have made it possible for vegetable, market and kitchen shopping needs to be done online instead of going to a market. According to a recent press release, the OkeSayur application was born from the concern for the weakening existence of the traditional markets due to changes in the way people live. With shopping habits shifting towards modern markets, the application aims to preserve the local traditional markets. The app serves not only as a way for an easier and more efficient shopping experience for vegetable, market and kitchen products, but it will also protect the existence of traditional markets. The products being offered by the application are sourced from the traditional markets in the Yogyakarta and Klaten regions. Currently, they are cooperating with 10 partner merchants from the Kranggan and Klaten markets. These merchants are able to provide them with 150 various products that include vegetables, fruits, seafood, meat, kitchen spices, as well as organic products. To be more specific, the Information Technology student, who developed the app, shared that there are 64 kinds of vegetables, 39 fruits, 40 types of seafood, 20 types of side dishes, and some organic products available on their app. 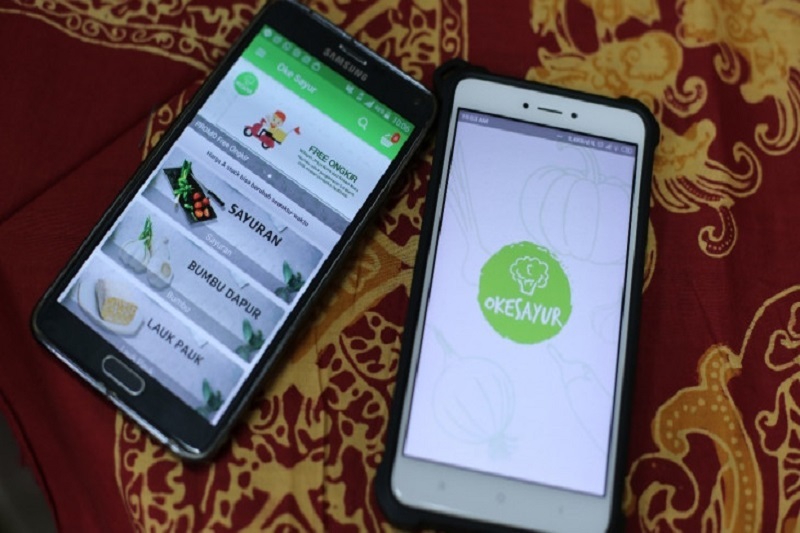 Initially, the OkeSayur application, which was created at the end of 2017, reached only consumers from the Klaten area, which is in Central Java. However, the services have expanded and can now reach the areas of Yogyakarta, Sleman, Bantul, and Kulon Progo. For those interested, the application can be downloaded in the Play Store for Android smartphone users. They can also visit the website or chat via the WhatsApp messaging application. The application responds to the incoming orders of the customers by purchasing the orders from their partner merchants and then delivering the products to the consumers. The deadline for orders to be delivered within the day is at 8am. If requests come after that, the groceries will be delivered the next day. Payments for the groceries can be done through different modes of payment. One of which is through a bank transfer payment system. Another would be to pay directly when the products are delivered. The students have won First place in the Information and Communication Technology (ICT) Business Development category at the Gemastik 2018 competition for this application. Future plans for OkeSayur include expanding the customer reach of the application beyond the Yogyakarta and Klaten regions. Moreover, its customer expansion would entail increasing the partner merchants as well. Customers in the new regions will be serviced by merchants and farmers in the surrounding area. In that way, OkeSayur will benefit not only the traders from traditional markets, but it will also benefit farmers who want to sell their agricultural products directly to consumers without the need to go through middle men.